So without further ado, here are the images to the before, after, and inspiration behind this fun adventure on wheels! 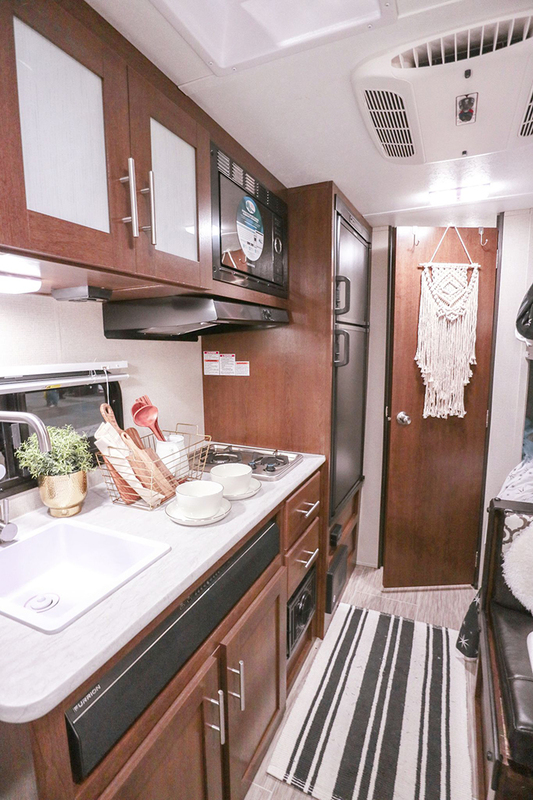 RVs are definitely becoming a trending travel option for any generation. It offers convenience and plenty of options at differing price points. For this particular one that I was charged to transform, it runs roughly $20,000 CAD with limited annual maintenance cost. 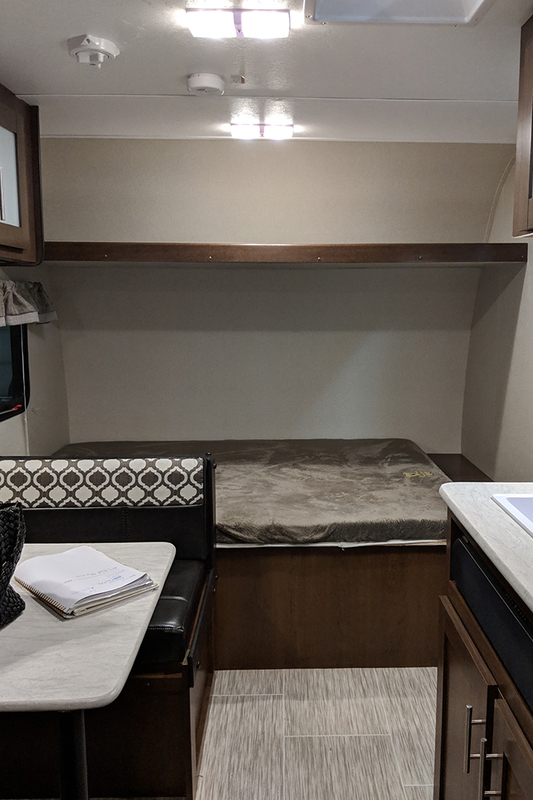 I really liked the layout of this RV, it was compact but had plenty of space – including a full double bed, two single bunks, a bathroom with shower, dining area, and a kitchenette equipped with an almost full size fridge. It’s honestly everything you need to comfortably take your adventures on the go. 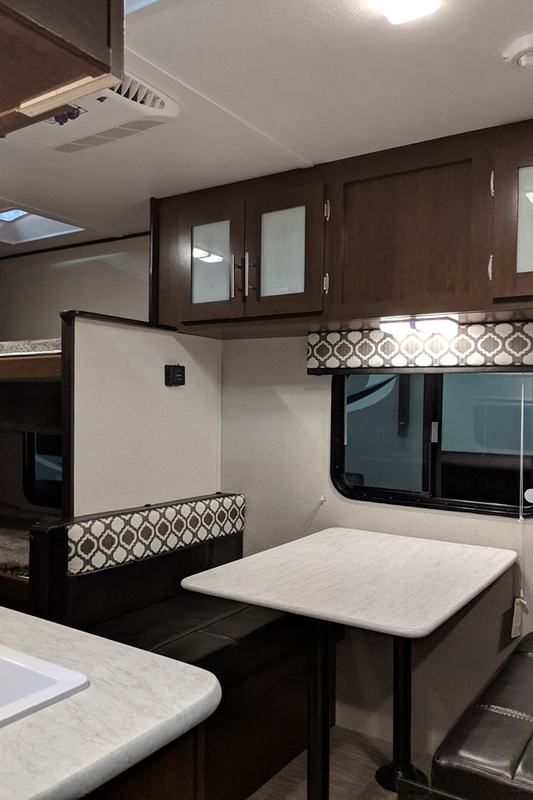 Admittedly, in my opinion, as perfectly laid out this RV was, and like many other RVs I’ve seen on the market, it definitely needed a bit of TLC to make it that much more special. 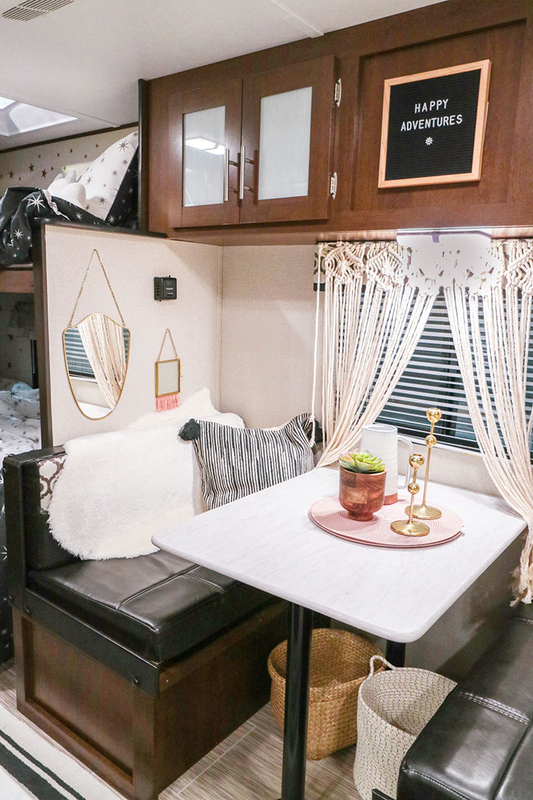 The inspiration behind the decor of this RV was “Happy Relaxed Bohemian”. 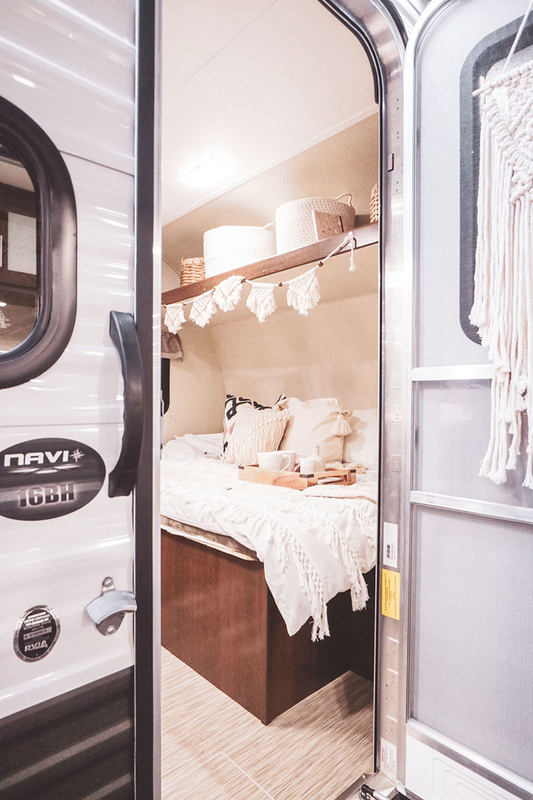 Imagine a cozy home away from home where a family can take their adventures anywhere they want, create precious memories without sacrificing comfort or style. 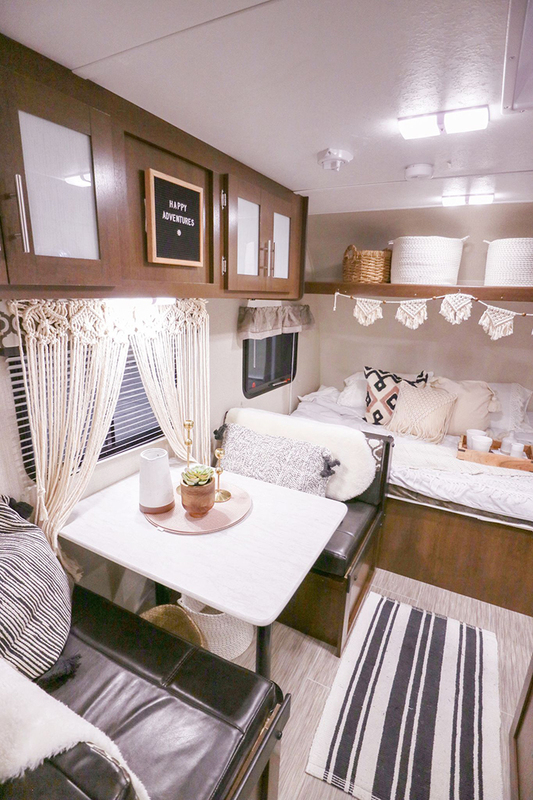 This easy and approachable RV transformation is inspired by the relaxed and happy vibes of retro bohemian style but modernized and simplified. It’s all about comfort. 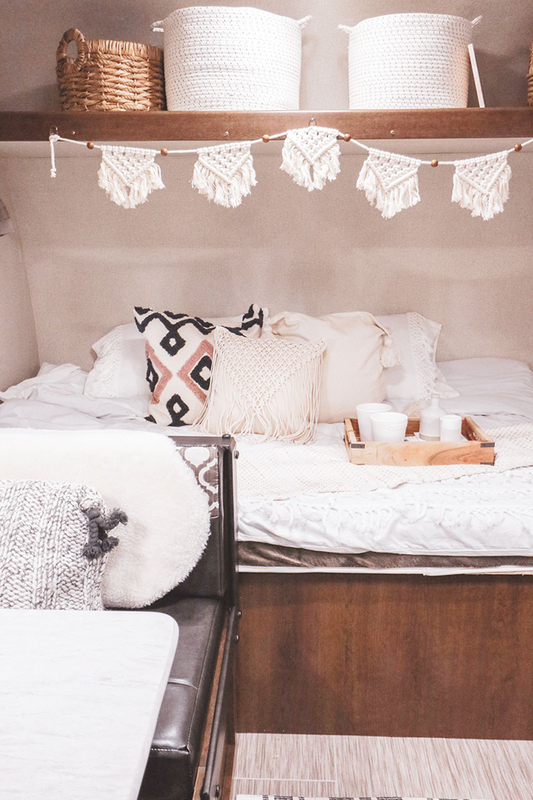 A large bedding area filled with plushy cushions and feathering duvet for mom and dad to relax after a long day of driving and the kids will equally enjoy a nap in their own private bunk bed quarters. Décor elements include crochet, rattan, and linen details as well as neutral and soft colours that is appealing to majority of the crowd. 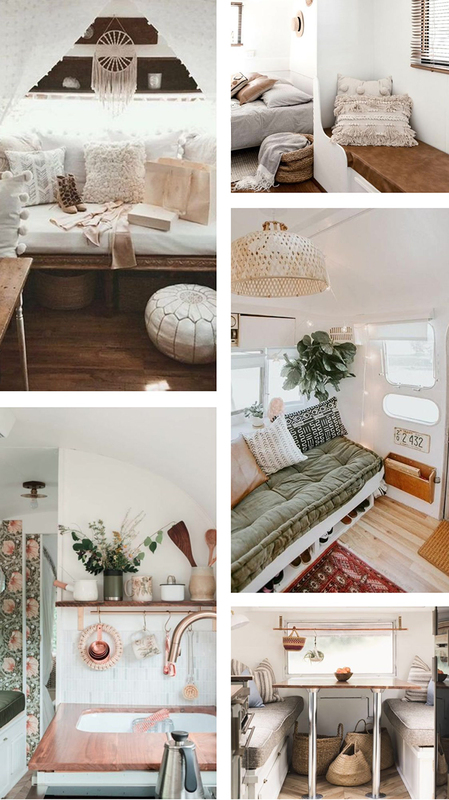 I found so many amazing RV interiors during my research on Pinterest, it really solidified what a little bit of effort (and perhaps a fresh coat of paint which I wasn’t able do), can do! Can you imagine integrating a few minor renovations? Possibilities are endless! Here is my own rendition of “Happy Relaxed Bohemian”! 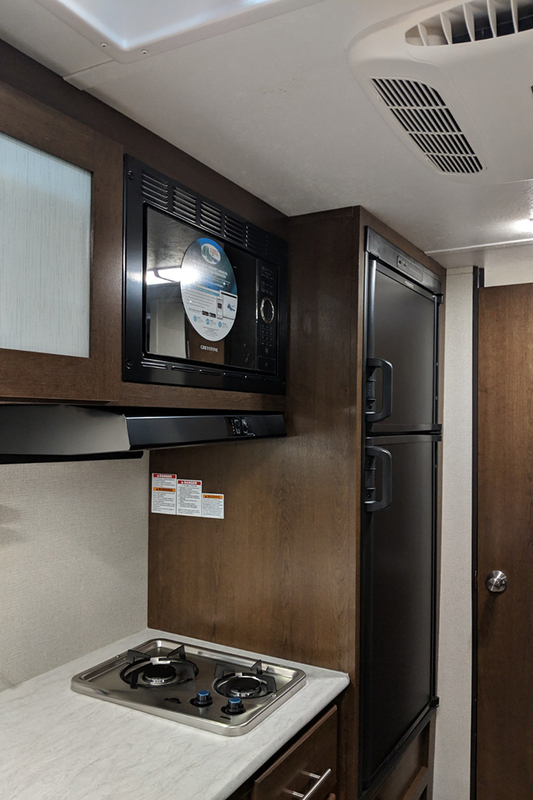 If it was up to me, I totally would have put a fresh coat of light paint on the cabinets, however since the ORVDA was graciously drawing this RV as a contest prize at the Toronto RV Show that took place a couple of weeks ago, we really wanted to keep the original finishing intact. 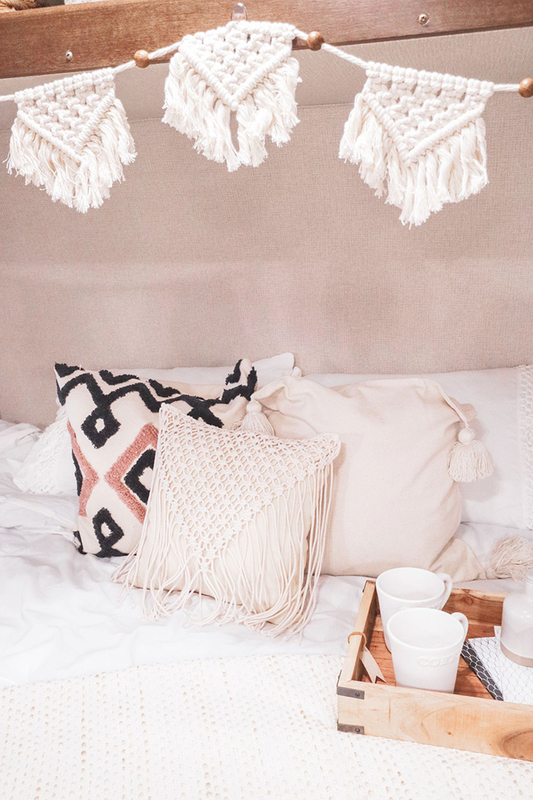 With that being said, Command products are SO great for temporary options – such as hanging frames and garlands. They are a lifesaver without making any permanent changes. 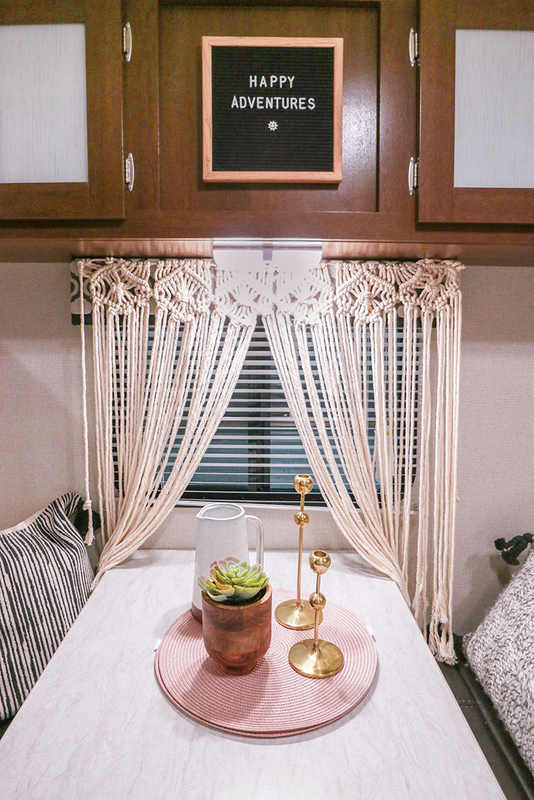 I was so thrilled to find bohemian inspired macrame decorations via Amazon.ca and the fringed hanging over the window is definitely one of the best options to give the dining area an uplift without worrying about sewing custom drapery for the RV. 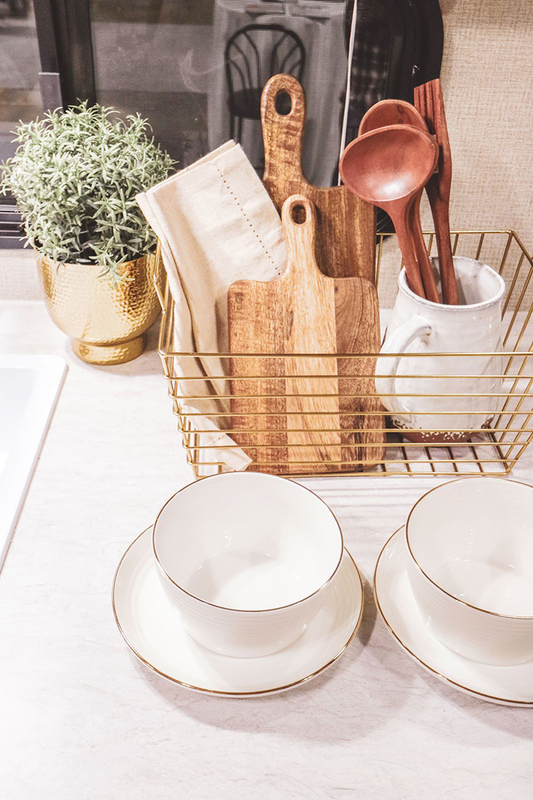 I also used a variety of baskets in different texture primarily for storage options but they also add such a great decor element to the space. When it came to the bedding area, I decided to reconfigure to a day bed format, so that I can both be enjoyed for sleeping and lounging. Loads of plushy cushions make it extra comfortable and I encourage you to switch our cushion covers ever so often. It’s is the best and most inexpensive way to update a space! 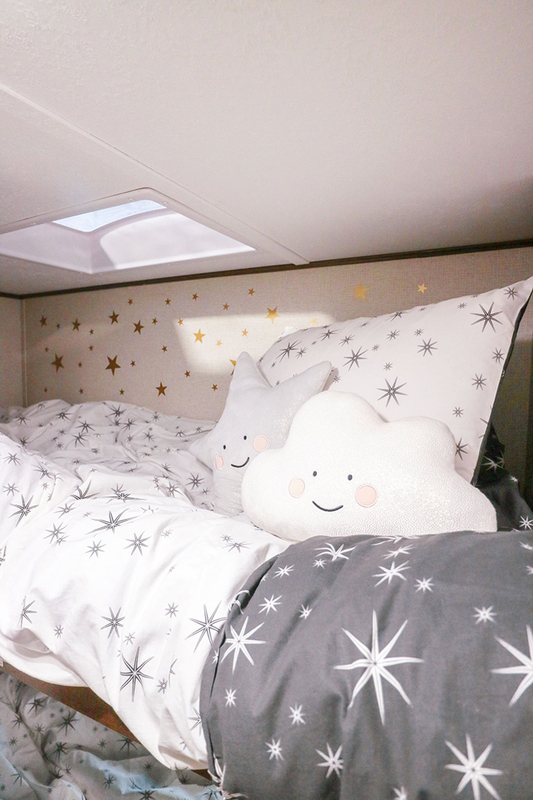 I had a little bit of extra fun with the bunk bed space designed perfectly for kids by adding fun star decals to the walls that can easily be removed! I hope you guys liked what I did to the space and I am absolutely going to be giving RV-ing a try in the near future! 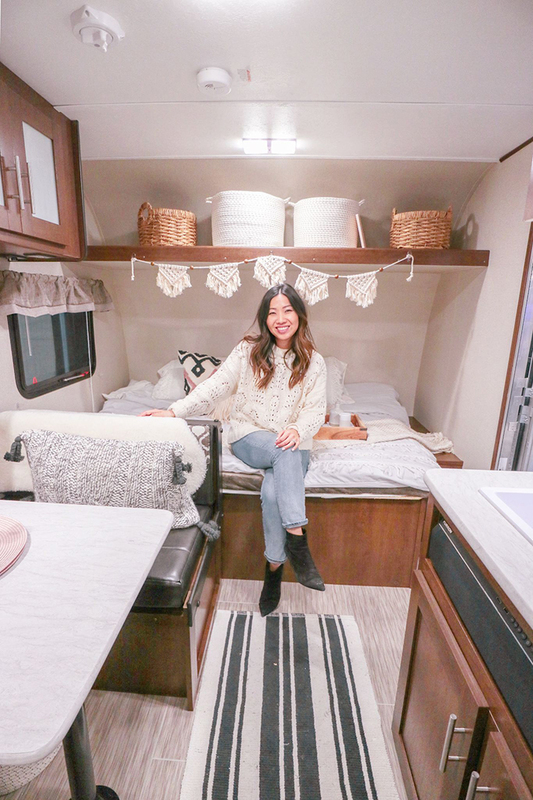 Stopping and going whenever we want and touring this beautiful province of Ontario in comfort (and style) sounds just like the perfect Summer time getaway!